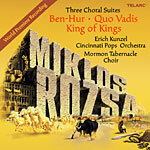 Late in his career, Miklos Rozsa started to arrange Choral Suites from his music to the big hollywood films "Ben-Hur", "Quo Vadis" and "King of Kings". Unfortunately he died in 1995 before completing this task, and the project was subsequently completed by a group of friends and pupils of the great composer. With assistance and support from the composer's son Nick Rozsa, this world premiere recording of these suites is the culmination of that project. The music is performed by the Cincinnati Pops Orchestra and the Mormon Tabernacle Choir under the direction of conductor Erich Kunzel. It was when Rozsa was working for the MGM studio in the 1950s and early 1960s that these great epic movies were lavishly filmed and recorded. Quo Vadis was the first in 1951, followed by Ben Hur in 1959 and then King of Kings in 1961. All these movies have a Christian or biblical theme to them. Quo Vadis is a love story between a Roman general and a Christian woman during the time of Nero, Ben Hur is the story of a Jewish Prince who is thrown into slavery but achieves both revenge and redemption meeting Jesus Christ along the way, while King of Kings is a straightforward telling of the familiar story of the life of Christ. With this religious foundation to the films which inspired this music, it is entirely fitting that the choral parts of the suites are sung by the Mormon Tabernacle Choir. This 360-member choral group have appread around the world at numerous fairs, expositions and other great events, including the inauguration ceremonies of five U.S. presidents. The choir is led by Craig Jessop. The Cincinnati Pops Orchestra is no stranger to many kinds of music with many film and classical recordings to their name. Many of their albums have been directed by Erich Kunzel and also found their way onto the Classical Crossover or Classical Billboard charts. The suites have been put together to showcase the main musical pieces from the movies. This gives a rounded summary of the film highlights, while standing alone as convincing concert works in their own right. The music has been carefully handled, and both the performances and the recording have a superb attention to detail. This album is a great addition to any soundtrack collection, and highly recommended. More detail about the album and music samples can be found at Amazon.com or Amazon.co.uk.